Tower controllers handle all aircraft movement on the airport and up to 10-15 miles from the airport. The TRACON controller will set the initial sequence of the aircraft and once that is made, will transfer control of the aircraft to the tower controller. The tower controller makes the final determination of the arrival sequence. They may modify the TRACONs plan slightly to more expeditiously sequence other tower traffic and the TRACON arrivals. Primarily tower controllers are responsible for separation on the runways and taxiways of an airport. Tower controllers will coordinate with other members of the tower, TRACON, and Center to allow the efficient movement of aircraft within their airspace. 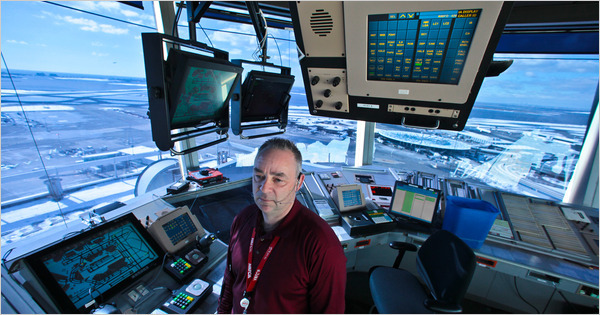 Generally, there are three main positions in any control tower. Local control, referred to as "Tower" by pilots, are responsible for all takeoffs/landings on the airport. Once the aircraft exits the runway the ground controller will provide instructions for the aircraft to safely taxi to parking. Ground control will also assign the runway the aircraft will taxi to and depart from. Ground control and Local control must work together very closely to ensure taxiing aircraft and arriving and departing aircraft do not conflict with one another. The third position commonly found in towers is clearance delivery/flight data. This position issues all route and altitude information to the pilot and makes appropriate changes to the flight to adhere with local procedures. They may also coordinate with all the other air traffic control facilities for departure and arrival times of specific flights.